The beloved teacher of spiritual wisdom and author of the phenomenal New York Times and international bestseller The Four Agreements takes readers on a mystical Toltec-inspired personal journey, introducing us to a deeper level of spiritual teaching and awareness. In 2002, Don Miguel Ruiz suffered a near fatal heart attack that left him in a nine-weeks-long coma. The spiritual journey he undertook while suspended between this world and the next forms the heart of The Toltec Art of Life and Death, a profound and mystical tale of spiritual struggle. As his body lies unconscious, Ruiz’s spirit encounters the people, ideas, and events that have shaped him, illuminating the eternal struggle between life—unending energy and truth—and death—matter and subjective knowledge—in which we are all called to engage. 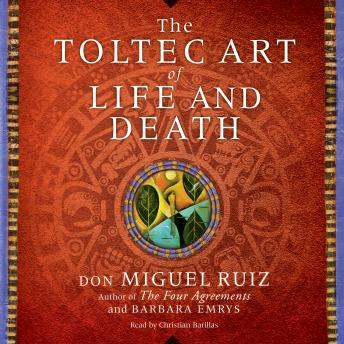 Over ten years in the making, The Toltec Art of Life and Death invites readers into the mind of a master of spiritual seeking, offering an unparalleled and intimate glimpse into the development of a soul. In this culmination of a lifetime's learning, Ruiz shares with readers the innermost workings of his singular heart and mind, and summons us to grapple with timeless insights, drawn from ancient Toltec wisdom, that are the essence of transformation. An interesting read but a little too much description for me in places. I wanted the story to move along quicker in providing spiritual insights.